Accessories: (OPTIONAL) Cable Gland & Stopping Plug and Mounting Hardware. PEW/DI/037 Ex-d/WP Size Dia 95 X 55/120 mm Internal Glass Window Dia 75mm (Direct Entry)..
PEW/DI/020 Ex-d/WP Size Dia 95 X 55/120 mm Internal Glass Window Dia 75mm. PEW/DI/029 Ex-d/WP Size Dia 165 X 55/120 mm Internal Glass Window 72x72 / 100x50 mm with control components on cover or 92x92 mm. 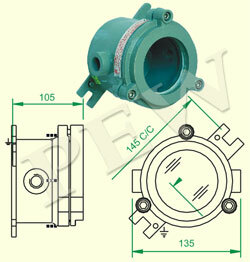 PEW/CP/036 Ex-d/WP Size Dia 125 X 100/160/210 mm Internal Glass Window 70x50mm with control components on cover. 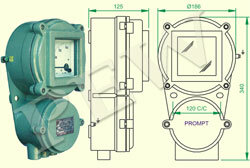 PEW/CP/036 Ex-d/WP Size Dia 215 X 100/160/210 mm Internal Glass Window 92x92 / 100x50 mm with control components on cover. 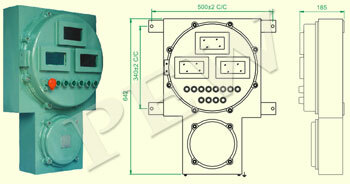 PEW/CP/036 Ex-d/WP Size 420x420x220 mm Internal Glass Window maximum 300x300 with control components on cover. 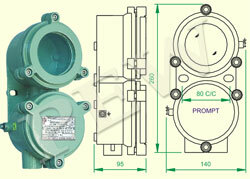 PEW/CP/036 Ex-d/WP Size 420x620x220/320 mm Internal Glass Window maximum 300x300 with control components on cover. PEW/DI/032 Ex-d/WP Size Dia 340 X 160 mm Internal Glass Window 92x92 / 100x50 mm with control components on cover.